Hello David. I went to one of your live by remote semenars the last time you were in Vancouver, B.C.. I went and thought, “Yeah, right. 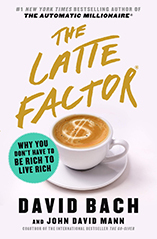 I am so broke I don’t even have a latte factor.” Well, long story short, we have purchased a house and when we were doing up our paperwork with Scotiabank, we rec’d your book. We have now in 3 months tripled our ‘do not touch’ savings and are planning a 1.5% increase at every 6 month interval until we are at 15% of our gross earnings. I have signed up for our pension plan available at work and doubled my RRSP contribution. My husband is also doing the same. I have recommended your book countless times to friends and family. I come from a single parent family where my Mom struggled to put food on the table and clothes on my and my sister’s backs. Now with a child of my own I refuse to get caught in the make-ends-meet lifestyle. For the first time in my life I am not stressed out about money. The best part was that it was easy to get it all together. Thank you very much for giving us the push that we needed in the right direction towards a stress free life. I am now even helping my Mom to get some more freedom with her finances.